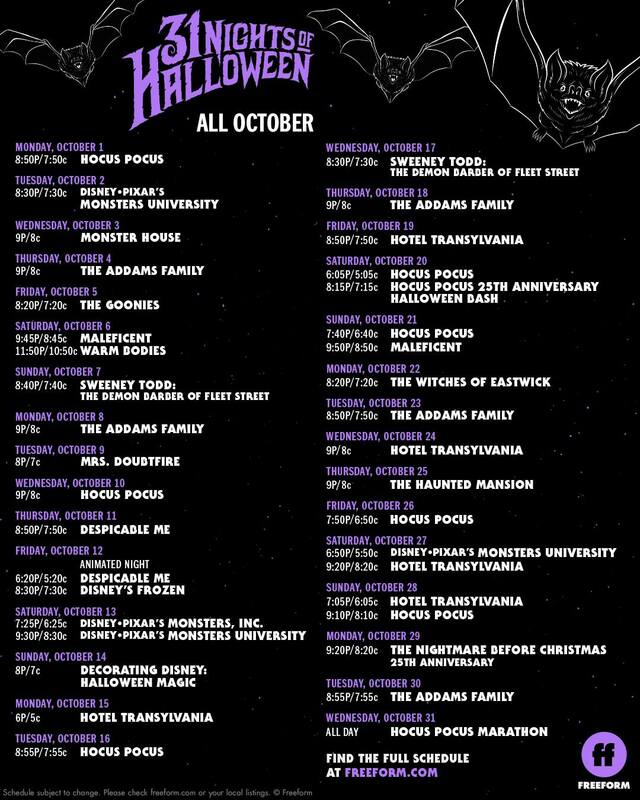 Freeform has announced their 31 Nights of Halloween schedule. Catch your bone-chilling favorites beginning October 1st. Check out all of the spooktacular programming HERE. In celebration of Freeform’s recently announced “31 Nights of Halloween” programming event, the network is transforming the historic Lombardi House in Hollywood, California, into Freeform’s Halloween House, the ultimate destination for Halloween lovers. Open to the public from Thursday, October 4 through Tuesday, October 9, visitors can enjoy an eerily immersive experience celebrating the 25th Anniversaries of “Hocus Pocus” and “Tim Burton’s The Nightmare Before Christmas.” Grab your lucky rat tails, join the pumpkin king and click here to reserve your spot! A pair of skeleton hands will welcome guests straight into Mr. Oogie Boogie’s Lair, Dr. Finklestein’s Lab, and an interactive graveyard with 31 spooky tombstones. Plus, run amuck in the iconic Sanderson Sisters’ cottage and cast a spell in the giant witches’ cauldron, summon Winifred’s book, test your purity when lighting the magical black-flame candle, and see if you can spot Thackery Binx. The eerie experience will also feature one-of-a-kind photo moments for fans to capture on the scenic Spiral Hill like Jack Skellington and recreate the original film poster of “Hocus Pocus” with their witchy crews, and much more. Admission is free, with timed ticketing available today at www.31NightsOfHalloween.com. Freeform has expanded its annual Halloween programming event to “31 Nights of Halloween” bringing thrilling hits throughout the entire month. Beginning Oct. 1, audiences can enjoy fan-favorite Halloween movies, “Decorating Disney: Halloween Magic,” and specialized short-form content celebrating the holiday. This year, Freeform will also be the exclusive television home for the film “Hocus Pocus,” which is celebrating its 25 anniversary, and will end with an all-day marathon featuring the hauntingly beautiful Sanderson Sisters. Also marking a huge milestone, “Tim Burton’s The Nightmare Before Christmas” will celebrate its 25 anniversary on October 29. Freeform has debuted the first trailer for their series Marvel’s Cloak & Dagger! 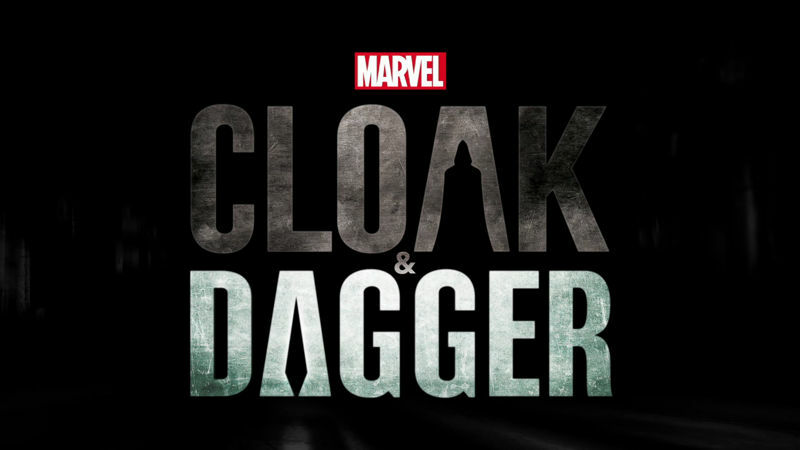 Marvel’s Cloak & Dagger is a coming-of-age series based on the beloved comic characters. Tandy Bowen (Olivia Holt) and Tyrone Johnson (Aubrey Joseph) come from starkly different backgrounds, each growing up with a secret they never dared share with another soul. The series is co-produced by Marvel Television and ABC Signature Studios. Joe Pokaski (Underground, Heroes) will serve as showrunner and executive producer, Jeph Loeb (Marvel’s Luke Cage, Marvel’s Iron Fist), Marvel’s Head of Television and Jim Chory (Marvel’s Luke Cage, Marvel’s Iron Fist) will also serve as executive producers. Gina Prince-Bythewood (Love & Basketball) is set to direct the first episode. The series also stars Andrea Roth (Rescue Me, Blue Bloods), Gloria Reuben (ER, Mr. Robot), Miles Mussenden (Bloodline, Queen Sugar), Carl Lundstedt (Grey’s Anatomy, Conviction) James Saito (Life of Pi, The Devil’s Advocate), and J.D. Evermore (True Detective, The Walking Dead). Freeform has ordered 10 one-hour episodes slated to debut early 2018.